The Capital side produced a dramatic second-half comeback to win 20-12 at Parc y Scarlets on Saturday night. 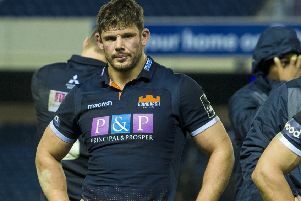 While pleased with his team’s response after a half-time rollicking, Edinburgh coach Richard Cockerill was scathing of their performance in the early stages of the match. He said: “That first half is not what we want to be known for. Having had a big week last week in a game we could have won [a 17-13 Champions Cup quarter-final loss to Munster] to that first half was pretty disgusting, really, from us. That second half was the complete opposite. What we won’t do is paper over the first half with what happened in the second. Scarlets breached the Edinburgh line in the 11th minute with a well-worked try following a line-out. It was created by a neat inside pass from Dan Jones to Leigh Halfpenny, who broke upfield before putting scrum-half Gareth Davies over. Halfpenny converted to give Scarlets a 7-0 lead. Scarlets scored their second try in the 25th minute with some neat interplay down the left touchline which allowed Steff Evans to put centre Jonathan Davies over. Halfpenny was wayward with the conversion. Two minutes before the break, Owens was yellow-carded for a professional foul as Edinburgh went close to the home try line. From the penalty, Jaco van der Walt missed the target with his kick. 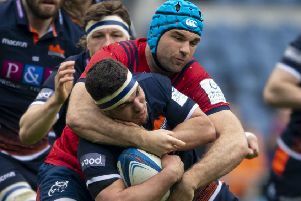 Edinburgh began their second-half comeback with a Van Der Walt penalty in the 45th minute. On the hour mark, centre Matt Scott took a great angle to go over unopposed for Edinburgh’s first try, converted by Van Der Walt. And just as Scarlets looked like they were going to produce their own score, Halfpenny gave a pass to Van Der Walt, who ran in 60 metres for his side’s second try. He also converted and four minutes later added a second penalty. Edinburgh were able to run down the clock and snuffed out any threat of a Scarlets comeback.